I thought I'd thank Hugh personally and publicly for his excellent review of the ART SplitMix 4. Short and to the point, I particularly noted his comment that passive devices such as headphones would not work in the output jacks due to loss of level. I'd love to show this to the guy at my local shop who when I enquired about splitting my headphone output into 4 headphones, tried to sell me the SplitMix. By the sounds of this review, I did the right thing by politely refusing to take his advice. Sadly, the same cannot be said of every music store sales assistant. That said, it is a highly useful device. For what it costs, it is worth having in the toolkit 'just in case'. It has saved the day for me on a few occasions! The Elf wrote: That said, it is a highly useful device. For what it costs, it is worth having in the toolkit 'just in case'. It has saved the day for me on a few occasions! It does look very handy. I can definitely see a use for it to mix say, 4 mics into one track (not sure why'd you do this specifically though). Having said this, it was definitely unfit for the purpose of which the sales assistant tried to sell it! Definitely not mic's! This is a stereo unbalanced device and designed for line. For myself, I have used it to split off mixer outputs to monitoring and FOH simultaneously, and also to mix a couple of stage keyboards. I've also used it to feed a recorder from a stage mix. Lo, I am ashamed. What's the penalty for such a ridiculous mistake? You have to buy a round at the next SOSauge meet. Yup; it was an excellent review, clearly explaining how the device can be deployed in different situations. 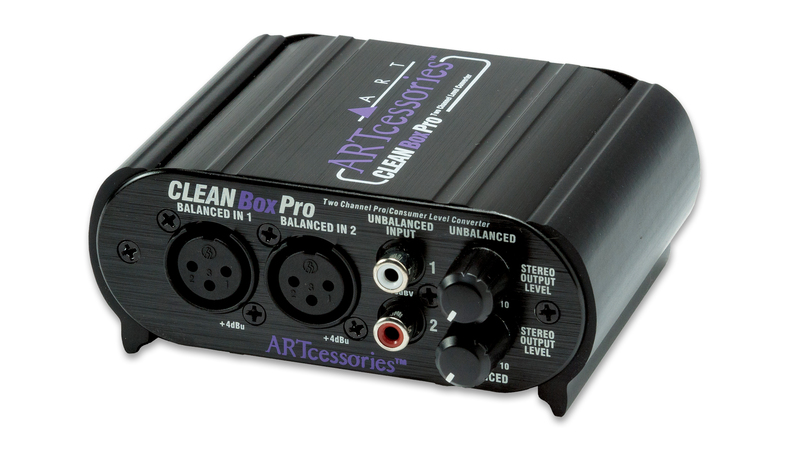 Behringer do something similar, but I can't comment on pros/cons as I've only glanced at it in passing. In the past I've specced distribution amps, but these can be expensive. These devices would do the job just as well for those on a budget. 1. TRS - The unit might be cheap, but you need TRS Y-cables to use it. And if you like nice stacks of gear on the floor, these cables need to be tough and long. I had only recently slimmed down my excess insert cables (which would have worked fine, but been a touch short) so if I do decide to use it in anger, I need to invest in good cables for it. Ironically, the unit is a good price, but you can blow that again in cabling. 2. Level. The article mentions the drop in level by connecting the devices and 12dB sounds about right. That's quite a big drop and might come as a bit of a shock. I was expecting a bit of a level drop, just not that much. So be warned and make sure that the other end can gain up a fair amount cleanly. It is a good little box and is held in reserve for when I need it. But I think knowing its weaknesses is a good thing too. Dave B wrote: 1. TRS - The unit might be cheap, but you need TRS Y-cables to use it. Yes, if you want to mix stereo signals. If you're mixing a bunch of mono sources then standard TS instrument cables will work fine. Ironically, the unit is a good price, but you can blow that again in cabling. Yes, fair point -- and a good incentive to make your own cables! The article mentions the drop in level by connecting the devices and 12dB sounds about right. That's quite a big drop and might come as a bit of a shock. The level drop is inherent in the nature of its passive design and it is important to be aware of it, as you say. However, in practice I doubt it is going to cause any problems -- I certainly haven't found any issues. Most modern keyboards can chuck out more level than most destinations require, and when mixing sources together the level usually goes up anyway, so think of it as some free headroom! So, an addendum to this. I've been using mine for live work for a good while now (not much after this thread started in face). Originally, I paired it with my passive stereo DI box (Palmer) and, whilst it was fine, the level was dangerously low - most mixers were almost maxing out getting a healthy signal in. I could live with some headroom, but this was slightly OTT. Then I paired it with a Rolls headphone / mic amp / DI / 'more me box' which was powered and that seemed to bump the level back up a bit. All well, very happy. Last weekend, the Art failed on me - only one side going to the mix and that was intermittently distorting. Gig was fine and I've just dismantled my SplitMix to investigate what happened. Once you get it apart, the design is interesting. The 'input' jacks are one type and seem to be incredibly solid and soldered onto the pcb with no gap. You can see the cable going in and locking nicely. So 10/10 for the input jacks. However, the output and the splitter sockets seem to use a different connector which is a sealed, one-piece unit which sits proud of the board by a mil or so and is therefore more prone to movement. It looks like my main output has taken a bit of a bashing and the connections are loose - I suspect that it's internal and not just the connections to the board. Which is annoying. So it seems my options are to either spend a few quid (admittedly not a huge amount) on another replacement - and treat this one with more care - or get someone handy with a soldering iron to either replace with a new one, or swap with one of the 'split' sockets (I don't use that whole chunk of the unit, so a 'dead' socket up there is no biggie. In short, the box is rugged and can take a beating. The input sockets also. But be gentler on the output and any splits that you are using. I'll have a look at it for you, Dave. With a bit of foreknowledge, you could have brought it over when you came yesterday. Cheers Wonks. I had so much stuff to look at this weekend, I only got around to it after I came over! And I don't like to presume - but the offer is gratefully accepted - I'll give you a shout later. Ta very muchly. It has always surprised me that some enterprising bod has not produced a simple 2 channel "level lifter"? I am thinking something with a gain of 0 to about 15dB which would lift a -10dBV source to the pro +4dBu point and a have a maximum output of around +22dBu, impedance balanced on TRS. Such a box could be made very cheaply I think with a couple of decent chips and SMT? Powered by 2X PP3 with an external power option. I can find any number of small mic pres and RIAA corrected phono amps but nothing with the above specification. Now of course I shall be shot down with a dozen links to JUST such a device! ef37a wrote: It has always surprised me that some enterprising bod has not produced a simple 2 channel "level lifter"? There's load of them, across a wide range of prices. Normally marketed as a 'domestic equipment interface' or something along those lines, and they usually include a two-channel attenuator for padding down pro-level audio to a nominal -10dBV, as well as the gain stage, so the device converts 'both ways'. There's load of them, across a wide range of prices. Normally marketed as a 'domestic equipment interface' or something along those lines, and they usually include a two-channel attenuator for padding down pro-level audio to a nominal -10dBV. Yes Hugh but you are paying for mic pres you don't want and a "padded down" line input will probably compromise the noise performance. As I said, there are sheds of things for mics and mag pups but a simple, low noise 15dB line amp seems rare to non-existant? There are no 'mic pres' involved here. Just a pair of adjustable line balancing amps with up to 21dB of gain (in this example). ...and a "padded down" line input will probably compromise the noise performance. No, not to any audible degree... but I think perhaps you mis-understand the concept and application. 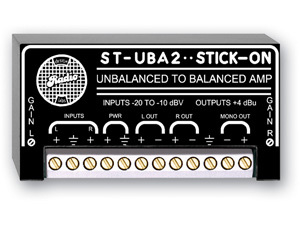 In the device mentioned above the active amps raise the level of nominal -10dBV to nomninal +4dBu and balance the output, while the other have of the box has pads to accept nominal +4dBu and pad it down and unbalance it for nominal -10dBV outputs. Just the thing for hooking up a domestic cassette recorder or video recorder into a professional system. And as I said, they really aren't! B,B.But! It has XLRs and phantom power! No it don't (***eyes!) Thought that said "+48" Still XLRs and not the simple device I am thinking of. Still XLRs and not the simple device I am thinking of. Well, it has balanced outputs and XLRs are convenient... but yes, TRS sockets would do to., And yes, it's a more elaborate than your suggestion, but that's to make it more useful in the real world of limited market / sales. ...although that has no PSU, no sockets at all, and costs a ludicrous £160!!!!!!! I completely agree with you that a simple case with a couple of RCA-phonos, a couple of TRS sockets, some +20dB balancing amps and a dual PP3 battery holder would be useful and cheap and easy for DIY construction... but would the sales market be sufficient to make production cost effective for a mainstream manufacturer? Yes, useful. I see quite few posts where people want just 10dB or so of gain to lift some bit of "domestic" gear up to proper line level but as you say, could it be a commercial success? I think it could, with SMT the PCB would be about the size of a postage stamp and cost less! Most expensive part would be the tin and pot. Of course, such a device is easily within the capabilities of most on THIS forum but the level of practical skill "out there" generally in Home Recording Land is abysmal. There are a million YT "How Tos" but nothing beats a book.